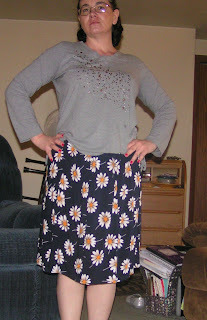 I have a sewing FO to share today - my Daisy skirt! 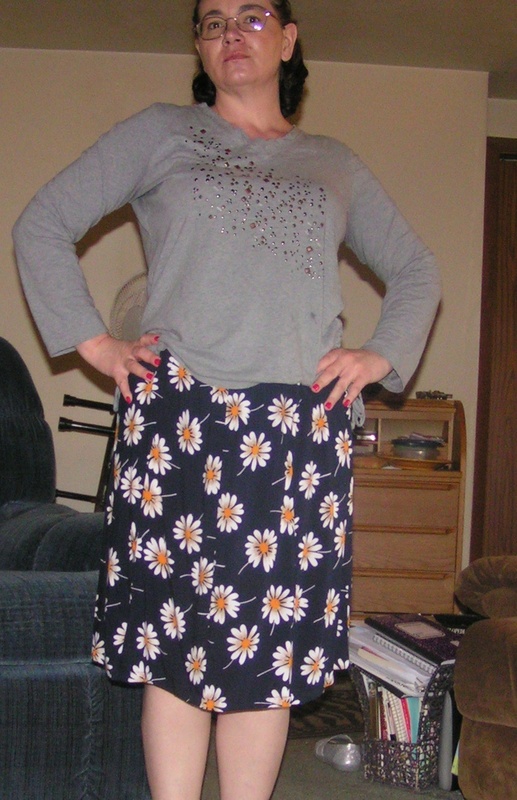 The pattern is the Bossa Nova skirt from the fabric.com website. It's my first time using a digital download pattern and thank goodness it's an easy one - we don't have a lot of clear, flat space for taping in this house. I bought the fabric at a yard sale. I think it's rayon, but I'm not totally sure. It's very light and swishy and Eric likes it. No, this isn't how I wore it today. I just put it on for a picture because I wanted to share - it's been a while since I've sewn something that I really want to wear. Maybe soon we'll have a warm, sunny day and I can show it off. As for knitting, it has been all dishcloths. Mom will be selling some quilts at a craft show next weekend and I'm hoping to make a few bucks. I gave her a bag full this morning - about ten, if I remember right, and can have several more done to give her on Friday. They take almost no time and I have such a big stash of cotton in lots of colors. I like making them, too - the easy knitting helps calm my mind or watch a show while I'm working. I forgot to take a picture of them all for ravelry, dang it. I realized that it's been several months since I've gotten an email from my knitting group. I don't know if there's no more group or if I'm just not invited anymore. That's all for today, my dears! I'll see you soon. Hugs!